In Speed Secrets Weekly #134, we answered some questions from readers. A couple of those answers discussed the use of trail braking to carry more speed through the corners. This is an advanced technique that requires a lot of practice and we all know that practice at the race track is limited and costly. So why not use a simulator to teach yourself this technique? As you know, simulators simulate real cars and real tracks! But one thing that a lot of people don’t realize is that you can download data from certain simulation software programs such as iRacing.com. iRacing has a partnership with McLaren and you can use McLaren’s data acquisition software (ATLAS) to analyze your data. There are even ways to get the data into MoTeC’s data acquisition software (i2 Data Analysis). 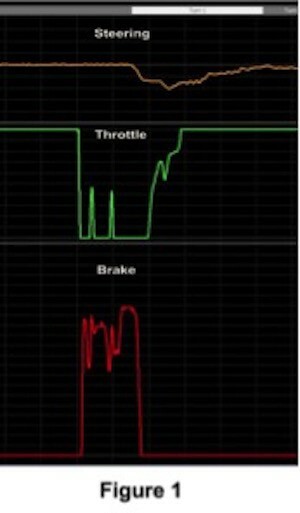 The ability to look at your data gives you the ability to analyze whether or not you are performing a driving technique (such as trail braking) correctly. You don’t have to have an expensive simulator to effectively teach yourself some of the more advanced driving techniques, but there are a few things that you’ll need. One of the most important things is a brake pedal that feels like a real brake pedal. In other words, it needs to be firm. It is much easier to modulate brake pressure if the brake pedal is firm rather than soft. In some of the basic pedal sets that you can buy (such as the Logitech G27 wheel, shifter, and pedal set), the brake pedal has a fairly soft spring, so it doesn’t feel very realistic - but you can modify it so that it’s firm and feels more realistic. The Logitech G27 is a great wheel and pedal set to start off with and one of the more popular modifications for the brake pedal is the Perfect Pedal (www.perfectpedal.com). Of course, you will need a robust computer with a powerful graphics card to run the simulation software; a good monitor is a must, as well. You can mount your wheel and shifter on a desk or you can go a step further and buy a cockpit. If you’re a racer, then you will probably compare these costs to some of your standard racing costs and realize that it isn’t that much money to have something you can use in your home to help you step up your game! So now that you have your simulator system setup, how do you use it to analyze what you are doing? In order to trail brake effectively, you should be applying the most amount of brake pressure when the car is going the fastest, and releasing the pressure as you approach the corner. There should also be a minimum amount of brake pressure as you are turning into the corner. This is exactly the opposite of what you would normally do on the street as you are approaching a red traffic light, and this is why it requires some practice. Here are a couple of data traces from two different drivers in the same type of car, going into the same corner on iRacing.com. These highlight the differences between using and not using the proper trail braking technique. 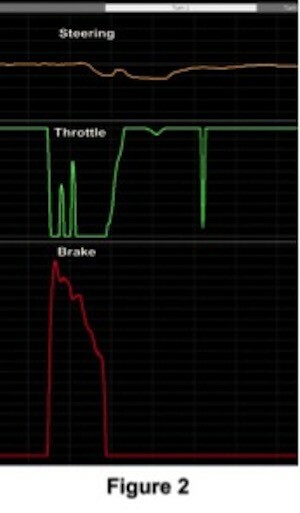 The data traces show steering, brake, and throttle. In Figure 1, the driver was not trail braking properly and you can see that the brake pressure builds up quickly, stays roughly the same, and then increases again as he gets closer to the corner. Even though this driver did have some steering input while he was on the brakes, when he comes off the brakes, the car’s weight transfer from front to rear is dramatic because of the amount of brake pressure that he was using at the end of his braking. One of the advantages of trail braking is that it slows down the speed of the weight transfer from front to rear; this allows the driver to keep the car on the edge of adhesion. Incidentally, this driver was also experiencing lots of understeer through the corner. You can see that he had to lift off the throttle to transfer more weight back to the front of the car to give his front tires some more grip and minimize the understeer. The second driver practiced the proper trail braking technique. You can see that the pressure builds up much more quickly at the beginning of his braking, and then tapers off as he approaches the corner. This driver experienced a slight amount of oversteer, but he was able to get to full throttle much quicker than the first driver. Now that you know what the brake trace should look like, you can practice your trail braking and compare your brake traces to the one in Figure 2. The more you can gradually come off the brake pedal the better. Practice it enough and it will become second nature to you. And by the way, you can screw up and crash as much as you want on the simulator and it isn’t going to cost you anything extra!! 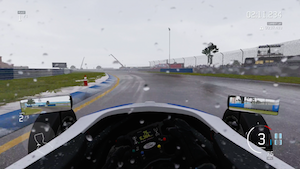 One item to note: if you are new to using a simulator, then you'll most likely need to be patient with the experience. It takes some time to get used to not having the feel of the g-forces, and you need to tune in your other senses (especially your vision and hearing) to tell you what's happening with the virtual car. One of the most common issues is properly identifying when to brake for the upcoming corner, so to get over this, you need to really pay attention to the braking points. But once you get used to it, you can use it to teach yourself many of the things that you can use in your real-life racing or track day driving. These items all come to mind: left foot braking, proper shifting techniques, race craft, and even maintaining focus for an entire race distance. Click here to find out about getting simulator seat time at Winding Road’s retail store in Austin, TX.